Ring News 24Boxing News Breaking Boxing NewsThe best heavyweights? – Who’s impressed? Who’s failed to impress? The best heavyweights? – Who’s impressed? Who’s failed to impress? The WBC champion has not been as active as in recent years and only engaged in two contests in 2017. Well, to call his first-round knockout of Bermane Stiverne a “contest” would be stretching the truth. Tubby Stiverne offered zero resistance as Wilder blasted through his challenger in an unwarranted rematch. Prior to that, Wilder had taken the unbeaten record of Gerald Washington in February. Washington was having a fair bit of success up to the point of stoppage. Verdict: Failed to impress – low level opposition and only two fights have made it a fairly mediocre year for Wilder who was scheduled to box Luis Ortiz before the Cuban once again failed a drugs test. Deontay will be pushing for a unification in 2018. After winning the IBF crown in 2016 and making two successful defences, British cash cow Joshua found himself in the first major test of his career against Wladimir Klitschko. In an epic heavyweight clash, Joshua came back from a knockdown to effectively outlast the veteran Ukrainian. 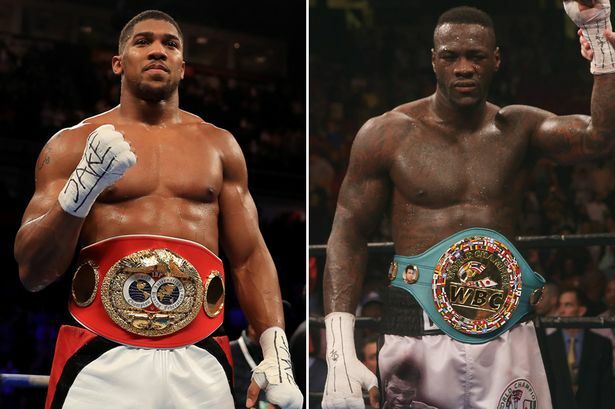 A less than impressive knockout of Carlos Takam in October followed and Joshua will have his eyes on unifications with the likes of Wilder or Parker in the New Year. Verdict: Impressed – the stirring victory over Klitschko erased everything else, including the underwhelming performance against Carlos Takam. A good year for Joshua. The New Zealander recorded five big wins in a breakout 2016, including a big fight in Samoa. Parker got past Carlos Takam and won the WBO title against Andy Ruiz Jnr. That was not followed up or built upon in 2017, however, as Parker only had two fights, starting with a dour points win over former sparring partner Razvan Cojanu and ending with an unconvincing points win over Hughie Fury. Verdict: Failed to impress – Two below par performances against average opposition. Badly needs a big fight in 2018. Talk of a clash with WBC champion Wilder appears fanciful as Whyte seems to be only competitive at British domestic level. After defeating Dereck Chisora in a stirring contest at the end of 2016, Whyte failed to build on that showing and had to wait until August, 2017 for his next outing. The Londoner travelled to America to defeat the shell of a former reasonable competitor called Malcolm Tann. Whyte then defeated Robert Helenius on October’s Joshua-Takam undercard. Verdict: Failed to impress – hanging around waiting for a big shot hasn’t suited Whyte. Are they afraid of matching him in case he gets beaten and a possible Joshua rematch or Wilder shot goes up in smoke? ‘Big Baby’ has done well to force his name into the mix, but the jury is out as to how good he is. Coming in around 300lbs in weight actually appears to suit Miller, who is more effective than his bulky frame suggests. Stoppage wins over Gerald Washington and Mariusz Wach are decent victories in the current era, but his trash talking abilities have helped to make him relevant. Verdict: Impressed – a relatively low bar in all honesty but Miller has done all that is asked of him and may be expected to feature in an Anthony Joshua title defence very soon. Only boxing for the first time in 2017 when he takes on Daniel Martz over the coming week. The WBC have apparently lifted a suspension on Ortiz so he can compete again. A career-defining clash with Deontay Wilder was cancelled when Ortiz failed a drug test. Verdict: Failed to impress – the dark horse of the division, but ageing Ortiz is getting on a bit and has no time to lose.